1 Alternative Rural Futures: Seeking the future cultural sustainability of NZ agriculture. 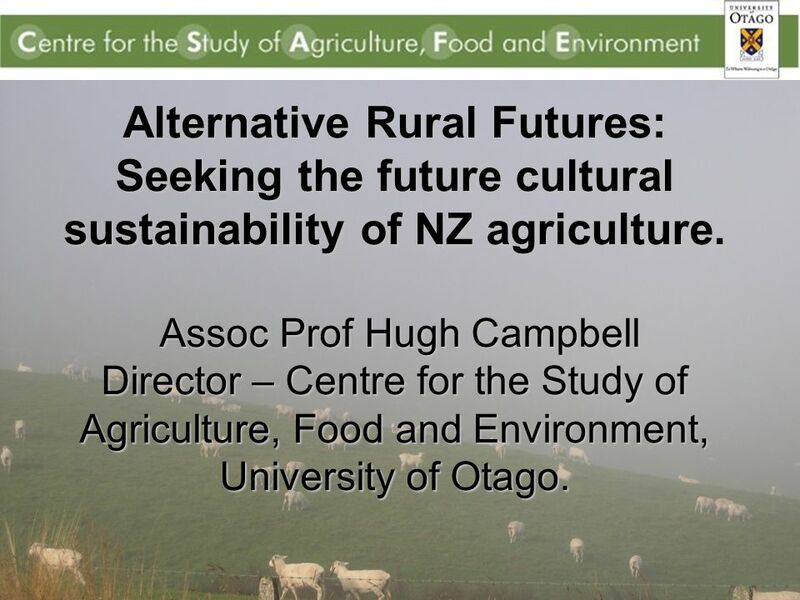 Assoc Prof Hugh Campbell Director – Centre for the Study of Agriculture, Food and Environment, University of Otago. 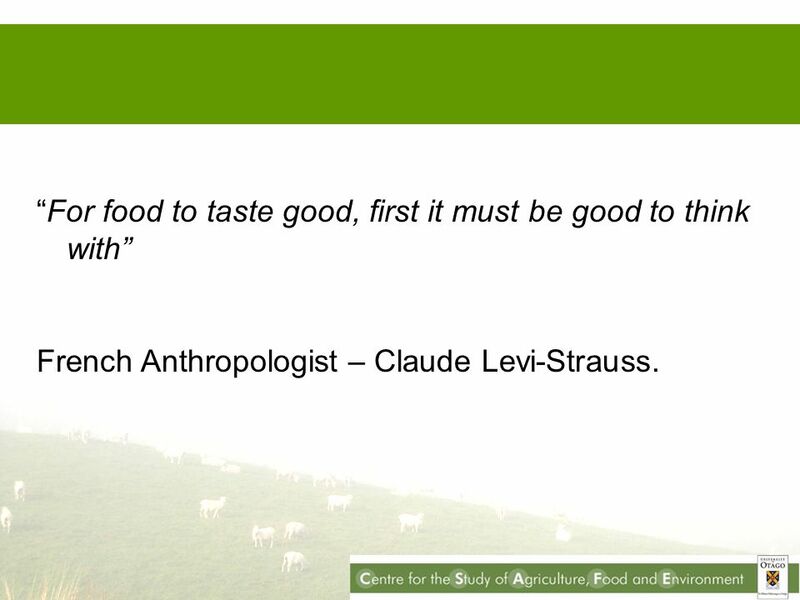 2 “For food to taste good, first it must be good to think with” French Anthropologist – Claude Levi-Strauss. 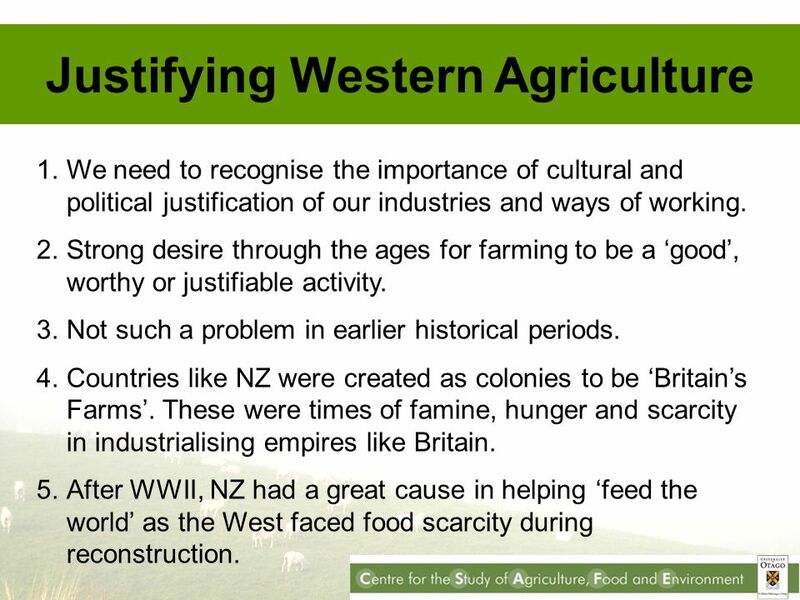 3 Justifying Western Agriculture 1.We need to recognise the importance of cultural and political justification of our industries and ways of working. 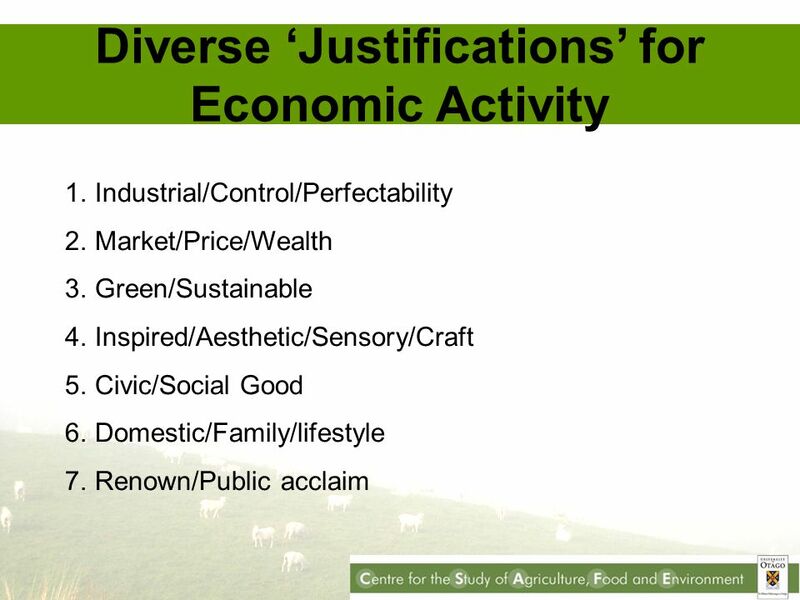 2.Strong desire through the ages for farming to be a ‘good’, worthy or justifiable activity. 3.Not such a problem in earlier historical periods. 4.Countries like NZ were created as colonies to be ‘Britain’s Farms’. These were times of famine, hunger and scarcity in industrialising empires like Britain. 5.After WWII, NZ had a great cause in helping ‘feed the world’ as the West faced food scarcity during reconstruction. 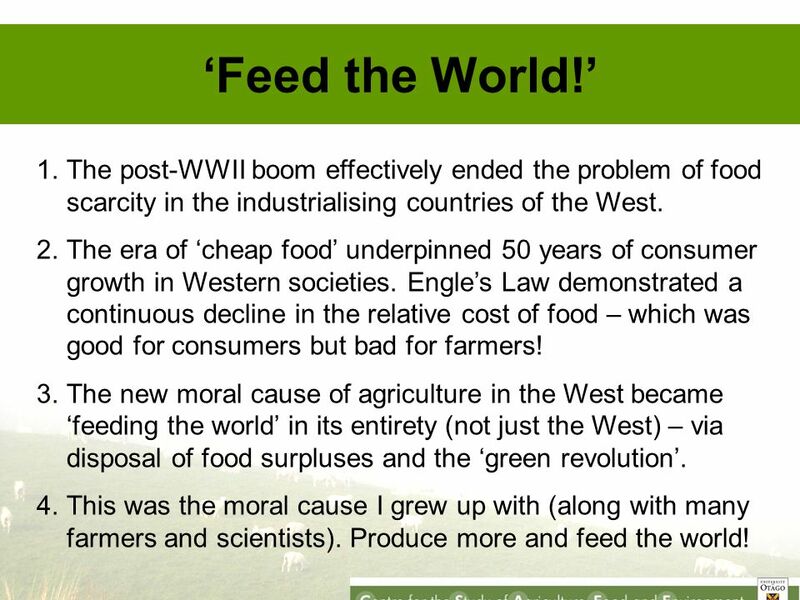 4 ‘Feed the World!’ 1.The post-WWII boom effectively ended the problem of food scarcity in the industrialising countries of the West. 2.The era of ‘cheap food’ underpinned 50 years of consumer growth in Western societies. Engle’s Law demonstrated a continuous decline in the relative cost of food – which was good for consumers but bad for farmers! 3.The new moral cause of agriculture in the West became ‘feeding the world’ in its entirety (not just the West) – via disposal of food surpluses and the ‘green revolution’. 4.This was the moral cause I grew up with (along with many farmers and scientists). Produce more and feed the world! 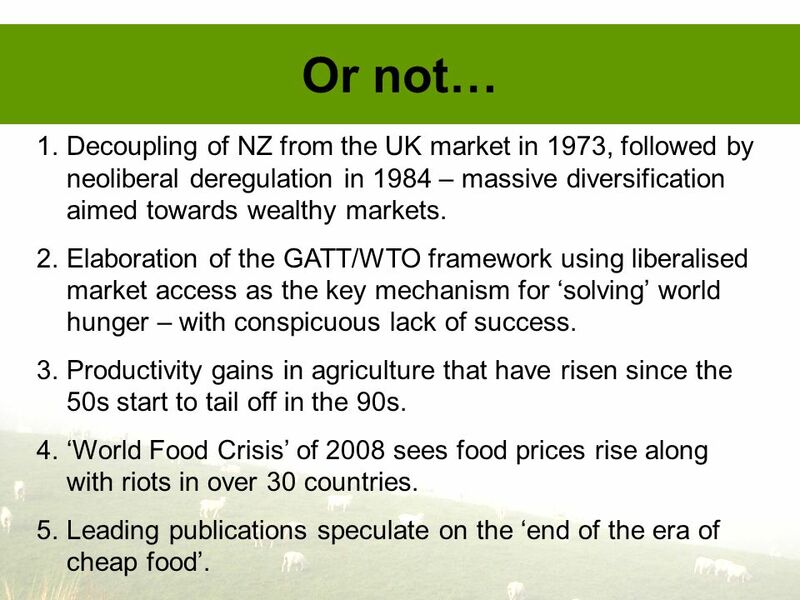 5 Or not… 1.Decoupling of NZ from the UK market in 1973, followed by neoliberal deregulation in 1984 – massive diversification aimed towards wealthy markets. 2.Elaboration of the GATT/WTO framework using liberalised market access as the key mechanism for ‘solving’ world hunger – with conspicuous lack of success. 3.Productivity gains in agriculture that have risen since the 50s start to tail off in the 90s. 4.‘World Food Crisis’ of 2008 sees food prices rise along with riots in over 30 countries. 5.Leading publications speculate on the ‘end of the era of cheap food’. 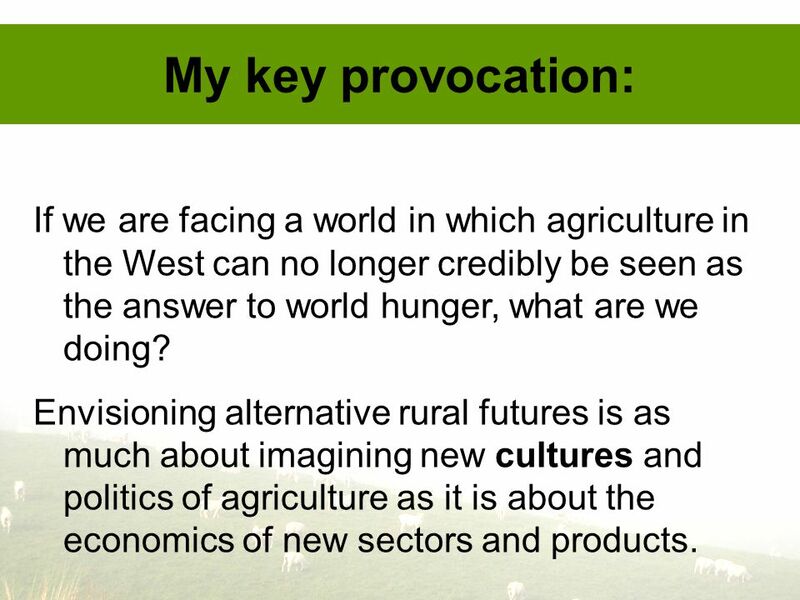 6 My key provocation: If we are facing a world in which agriculture in the West can no longer credibly be seen as the answer to world hunger, what are we doing? Envisioning alternative rural futures is as much about imagining new cultures and politics of agriculture as it is about the economics of new sectors and products. 7 Why is this important? 1.Current cultural justifications of agriculture (eg. increasing productivism) are contributing to a rupture between the urban and the rural in countries like NZ. 2.Consumers in high-value markets are increasingly interested in the cultural ‘story’ behind food products, but not necessarily the story that currently applies. 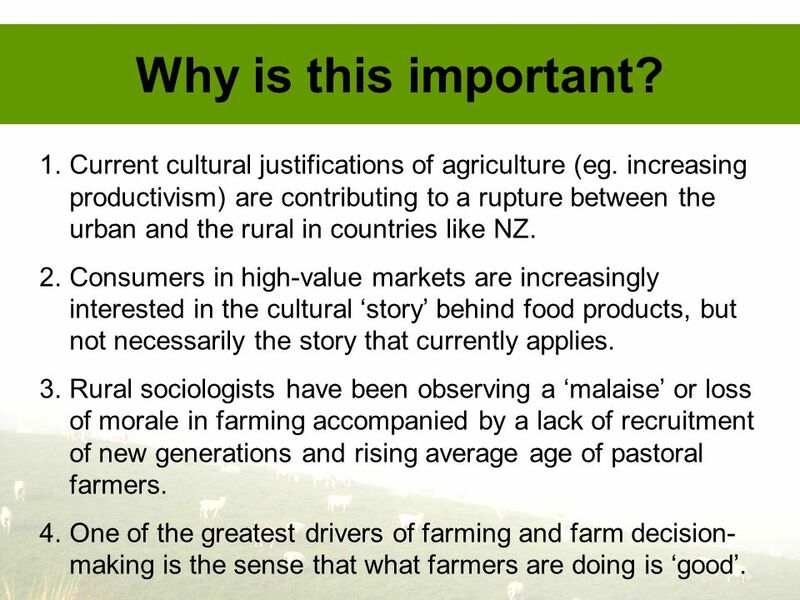 3.Rural sociologists have been observing a ‘malaise’ or loss of morale in farming accompanied by a lack of recruitment of new generations and rising average age of pastoral farmers. 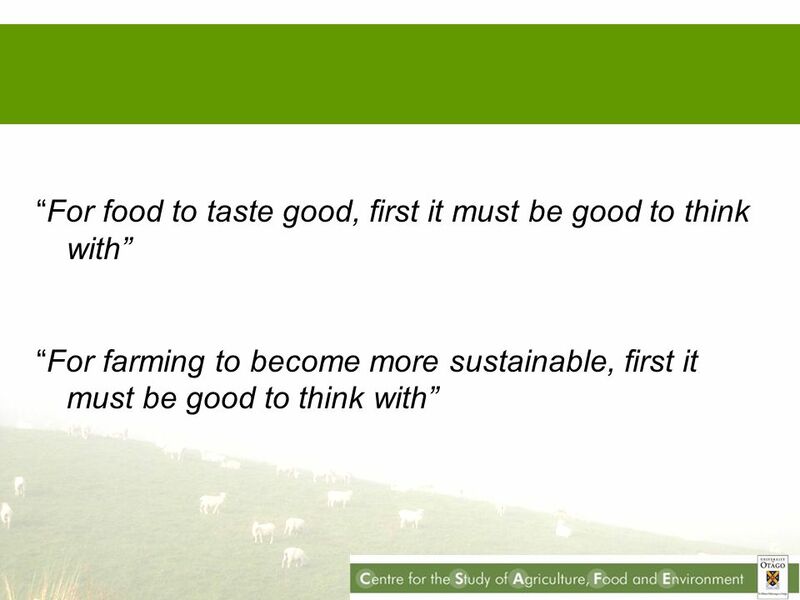 4.One of the greatest drivers of farming and farm decision- making is the sense that what farmers are doing is ‘good’. 8 Towards Alternative Rural Economies? Re-imagining the terms under which we understand agriculture as legitimate, good or ‘justified’ as an economic activity. Using sociological theory to try and uncover the different ways in which agri-cultures are justified or become accepted as good and worthwhile. Eg. 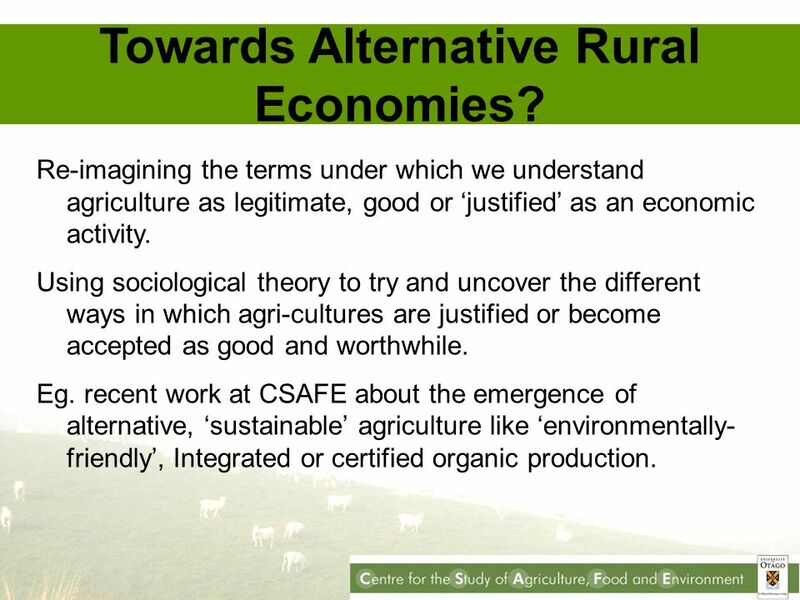 recent work at CSAFE about the emergence of alternative, ‘sustainable’ agriculture like ‘environmentally- friendly’, Integrated or certified organic production. 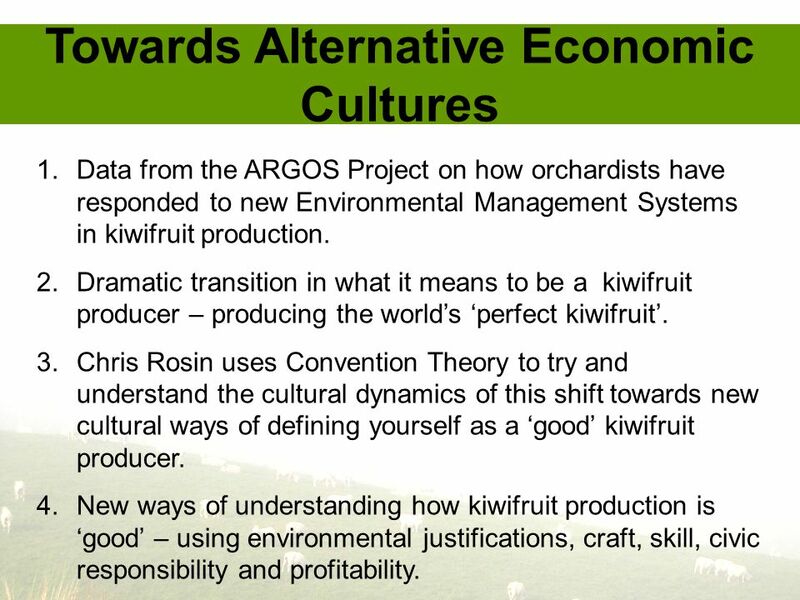 9 Towards Alternative Economic Cultures 1.Data from the ARGOS Project on how orchardists have responded to new Environmental Management Systems in kiwifruit production. 2.Dramatic transition in what it means to be a kiwifruit producer – producing the world’s ‘perfect kiwifruit’. 3.Chris Rosin uses Convention Theory to try and understand the cultural dynamics of this shift towards new cultural ways of defining yourself as a ‘good’ kiwifruit producer. 4.New ways of understanding how kiwifruit production is ‘good’ – using environmental justifications, craft, skill, civic responsibility and profitability. 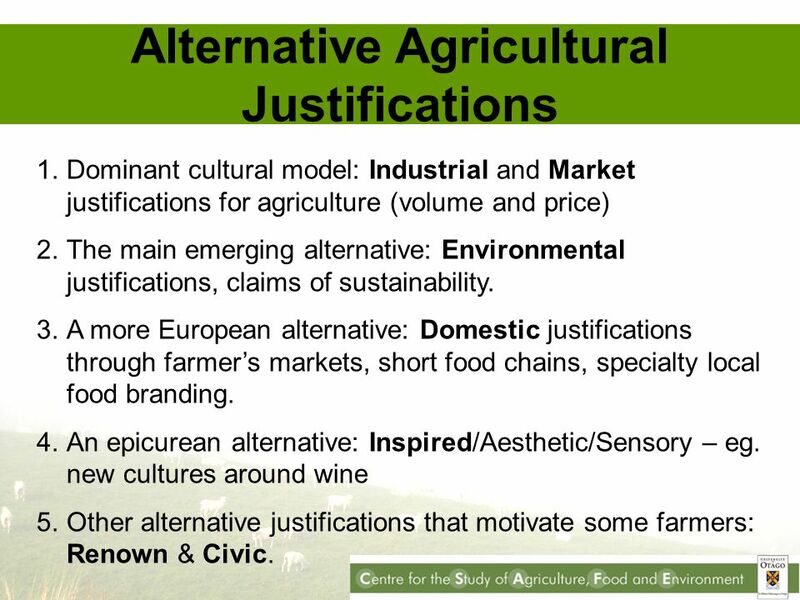 11 Alternative Agricultural Justifications 1.Dominant cultural model: Industrial and Market justifications for agriculture (volume and price) 2.The main emerging alternative: Environmental justifications, claims of sustainability. 3.A more European alternative: Domestic justifications through farmer’s markets, short food chains, specialty local food branding. 4.An epicurean alternative: Inspired/Aesthetic/Sensory – eg. 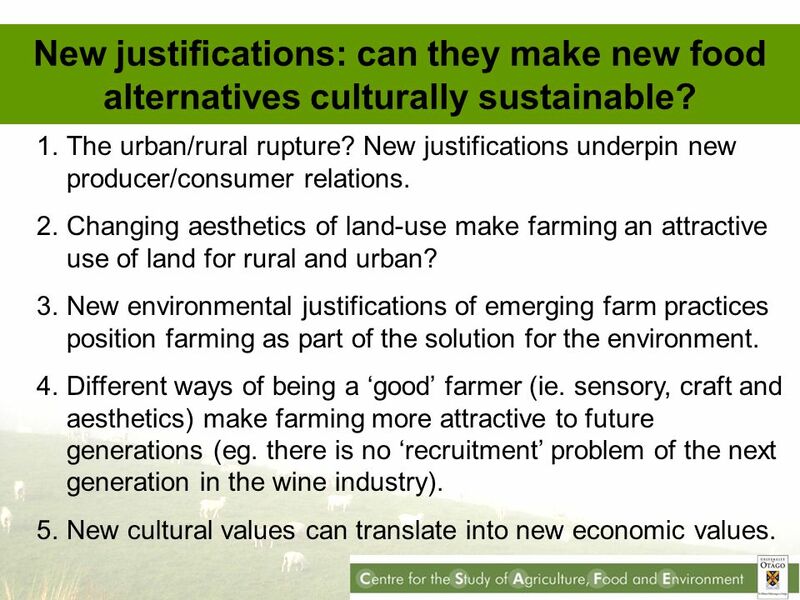 new cultures around wine 5.Other alternative justifications that motivate some farmers: Renown & Civic. 12 New justifications: can they make new food alternatives culturally sustainable? 1.The urban/rural rupture? New justifications underpin new producer/consumer relations. 2.Changing aesthetics of land-use make farming an attractive use of land for rural and urban? 3.New environmental justifications of emerging farm practices position farming as part of the solution for the environment. 4.Different ways of being a ‘good’ farmer (ie. sensory, craft and aesthetics) make farming more attractive to future generations (eg. there is no ‘recruitment’ problem of the next generation in the wine industry). 5.New cultural values can translate into new economic values. 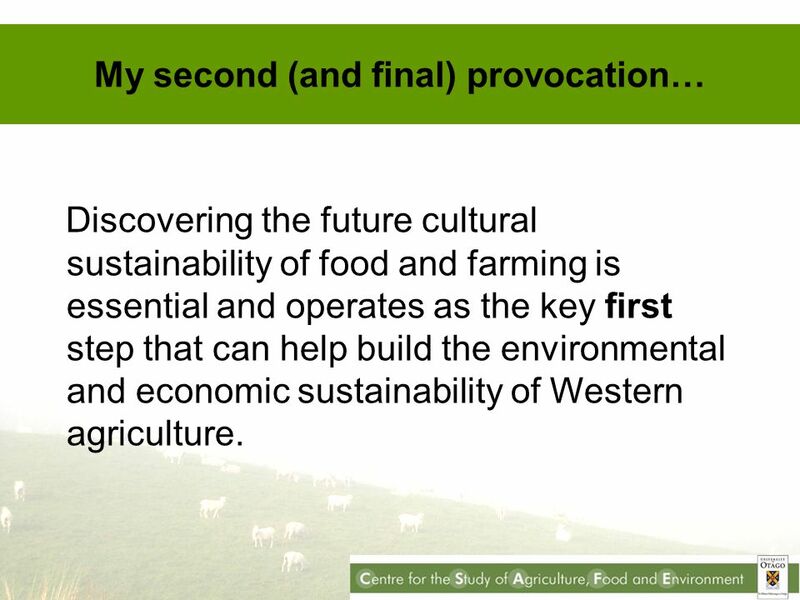 13 My second (and final) provocation… Discovering the future cultural sustainability of food and farming is essential and operates as the key first step that can help build the environmental and economic sustainability of Western agriculture. 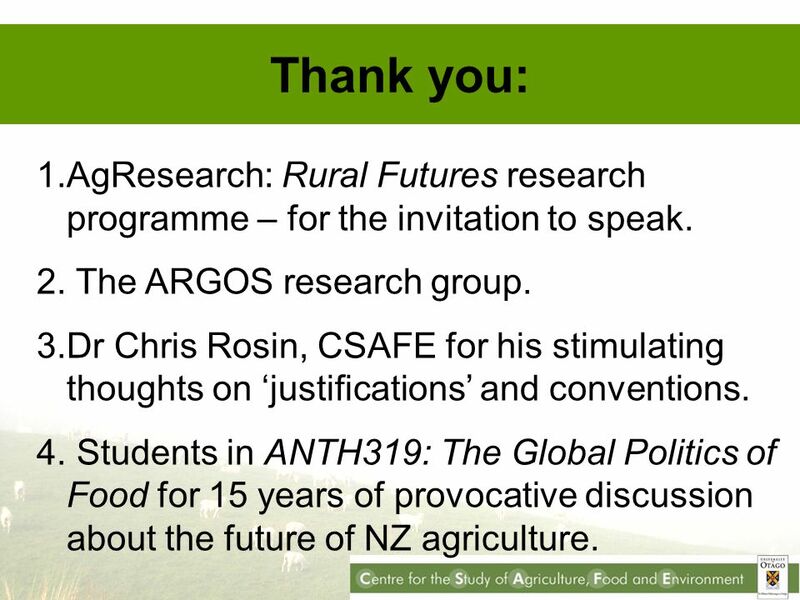 15 Thank you: 1.AgResearch: Rural Futures research programme – for the invitation to speak. 2. The ARGOS research group. 3.Dr Chris Rosin, CSAFE for his stimulating thoughts on ‘justifications’ and conventions. 4. Students in ANTH319: The Global Politics of Food for 15 years of provocative discussion about the future of NZ agriculture. Download ppt "Alternative Rural Futures: Seeking the future cultural sustainability of NZ agriculture. Assoc Prof Hugh Campbell Director – Centre for the Study of Agriculture,"
1 Local agri-food networks and environmental effects in Brittany Brussels workshop 8 June 2010 Fédération Régionale des Centres dInitiatives pour Valoriser. Azerbaijans 20 years of economic independence: Is it really independence? November 29, 2011 Ingilab Ahmadov. Honors Western Civilization Mrs. Civitella.  During the Scientific Revolution, scientists began to look at how living things interacted with nature to. Should Governments Subsidise Food Prices? To see more of our products visit our website at Neil Folland. Irish Agriculture – Future Opportunities The long-term prospects for agricultural products are positive: Need 60% more food and feed by billion. SOCIAL POLICY GUIDELINES FOR MINING SECTOR IN AFGHANISTAN Harjot Kaur Senior Social Development Advisor, Ministry of Mines. THE MAKING OF THE MODERN WORLD THE WEALTH AND POVERTY OF NATIONS LECTURE 1 – THE INDUSTRIAL REVOLUTION: ORIGINS. Non-farm activities in rural areas Lectures for the Master course in Non-Farm Activities and Rural Development in Developing Countries at the University. Deutschland Future policies for rural Europe 2013 and beyond – delivering sustainable rural land management in a changing Europe “Relationships with developing. Food Security 14 November 2011 Chair: Professor Tim Jones Panel: Professor Elizabeth Dowler Dr Rosemary Collier Dr Ben Richardson Professor Laura Green. Biofuels, Food Security and Environmental Sustainability: Global Challenges and Opportunities Daniel G. De La Torre Ugarte Presented to the Technical Society. Briefing on the Economic Partnership Agreement Christian Peters, Head of Macro-economic and Trade Section Delegation of the European Union to the Republic. Reconciling Trade Liberalisation with Human Security Goals. By: Anagha Joshi. The U.S. Food & Fiber Industry Linkages to the Farm Business Sector Spring 2010. Unit 1: Our Environment. OVERALL  Explain how population growth affects the sustainability of global ecosystems; SPECIFIC  explain how growth in population. The basic indicators and types of economic growth Prepared by: Bobojonov Mubinjon. Lecture GEOG 270 Fall 2007 October 8, 2007 Joe Hannah, PhD Department of Geography University of Washington.